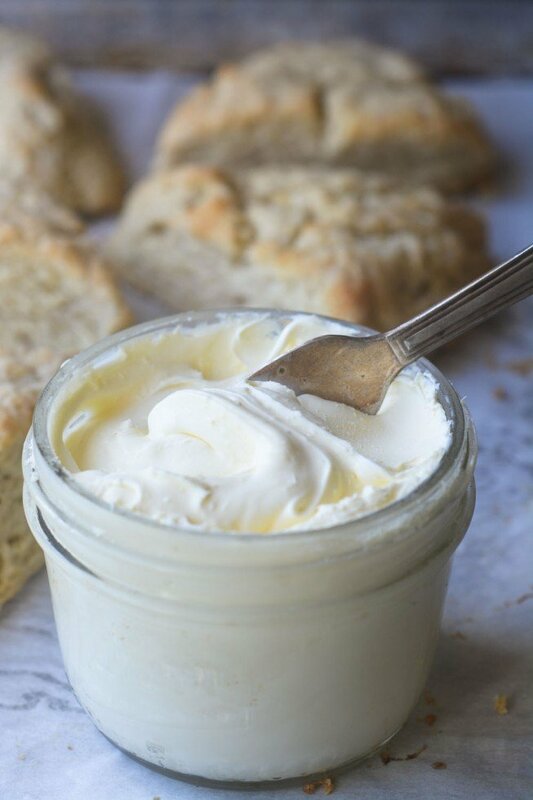 Homemade Clotted Cream ~ (aka Devonshire or Cornish Cream) this luxurious spreadable cream is a must for afternoon tea and scones, but no need to buy those pricey little imported bottles, because now you can make it right in your own kitchen! 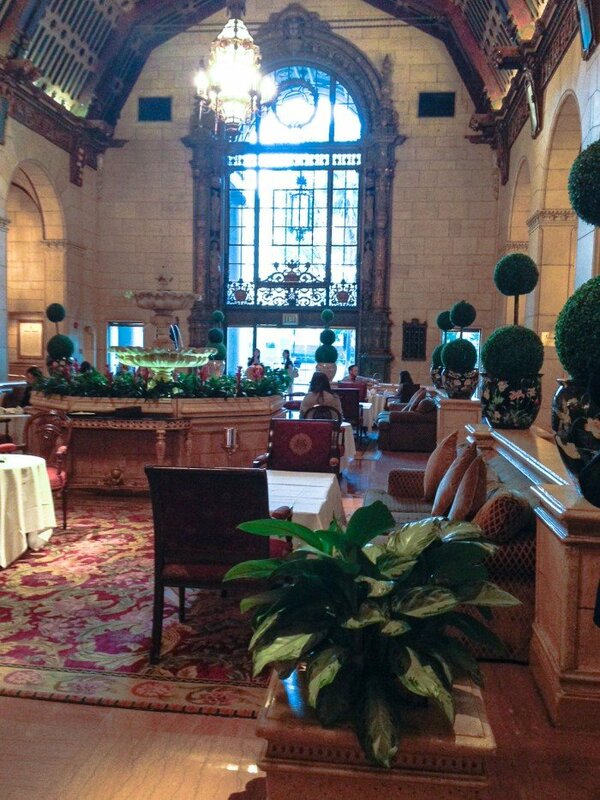 Last week I was treated by the historic Biltmore Hotel in downtown Los Angeles to their classic English afternoon tea. If you’ve never had a classic afternoon tea, you need to experience it, and the roaring twenties era Biltmore is the place to do it. Every inch of the hotel is carved, muraled, frescoed, tapestried, guilded, mosaic’d and generally so eye-poppingly gorgeous that it’s easy to forget you’re in Los Angeles. I almost forgot to drink my tea! If you’re looking for something special to do for Valentine’s Day, this would be fabulous. The tea room is the lobby of the original hotel, and so it’s fittingly grand, complete with a burbling marble fountain in the center and a grand staircase. The highlight of any afternoon tea, besides the tea, is the array of tiny treats that comes with it, and I always zero right in on the scones and clotted cream. (That’s them on level two of our tiered tea tray.) Clotted cream, if you’ve never had it, is a very thick rich spreadable form of heavy cream that was first invented ages ago by some very smart British farmers. It’s not like whipped cream, or cream cheese, it’s not like butter…it has a unique decadent consistency and a wonderful soft flavor. It’s quite thick and spreadable, and when you slather it on a freshly baked scone there is no better thing in the world. 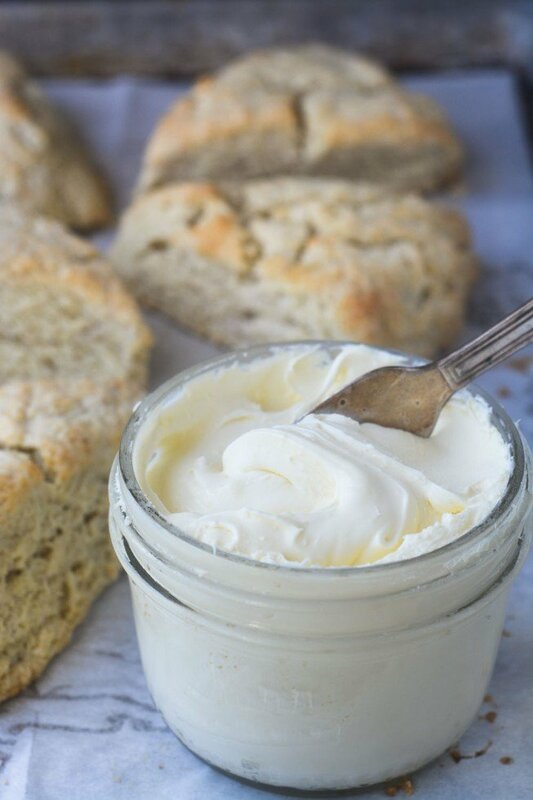 The little pot of clotted cream that we got at the Biltmore had me craving more, and happily I made the most astounding discovery…you can actually make clotted cream at home in your own kitchen. No more tracking it down in specialty stores and paying big bucks for the imported stuff. My homemade clotted cream was actually way better (and a whole lot fresher) than the British stuff I usually buy. This is an amazing process, I hardly had to do anything, and I end up with a ton of the richest, silkiest clotted cream I’ve ever had. I used 2 pints of cream, poured them into a baking dish, and left it overnight in a 180F oven (the lowest my oven will go.) In the morning I let it cool and then refrigerated it for the rest of the day. Then I scooped it into jars, which was a little sloppy at first, and put them back in the refrigerator. Any little bit of liquid gets absorbed right into the clotted cream after you put it in the jars, and by the next morning when I had it with my scones, it was absolutely to die for. I can’t say enough good things about this project, the results far exceeded my expectations and it was absurdly easy. The only catch is that you can’t use ultra-pasteurized cream, which is cream that’s been processed for a longer shelf life. Many stores only sell ultra-pasteurized cream, so you have to search a bit for regular cream. I found mine at Whole Foods. Just read the labels… if it doesn’t say ultra-pasteurized on the label, you’re good to go. You will definitely want to make scones to go with your homemade clotted cream. I have lots of recipes for scones on the blog, but this time I made Jennifer’s Cardamom Vanilla Cream Scones, and they were wonderful. Jen doesn’t use any egg in her recipe like I usually do, and I have to say I really liked the texture of her scones. And how can you go wrong with cardamom and vanilla? I highly recommend them. TIP: Make sure your cream is not ‘ultra pasteurized’, you will need to find regular pasteurized cream at a Whole Foods or other similar store. Ultra pasteurized cream has been treated in a way that prevents it from ‘clotting’. Pour the cream into the casserole dish. It should come up about 1-3 inches on the side. Set the dish, uncovered, in the oven and leave undisturbed for 12 hours. Be sure to leave the oven on the whole time. I do this overnight. Remove the dish from the oven and set to cool. Then cover and refrigerate. The next morning scoop the thickened cream into a jar or jars, and cover and put back in the refrigerator. You can use the leftover cream for baking..
An oven thermometer is an essential kitchen tool, and really comes in handy for this project. If your oven is too cool or too hot your homemade clotted cream will not ‘clot’. 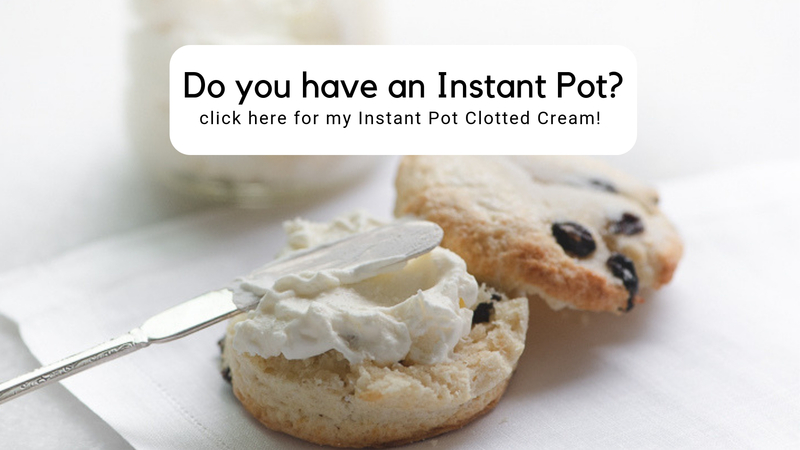 don’t forget to pin this tutorial on how to make clotted cream! So I’ve made clotted cream twice now in the same style and way you do. I’m able to get my hands on unpasteurised cream, which has a luxurious amount of fat, however, would this make it more cheesy? I’ve had an issue with my clotted cream developing a sort of cheesy taste if I mix in the crust, so much so I can’t use the crust or it’ll taste strange. Is this normal? Should I just try the Whole Foods pasteurised cream instead? Traditionally clotted cream would be made with unpasteurized cream, so I’m sure it would work, but I’m not sure how that would affect the flavor. 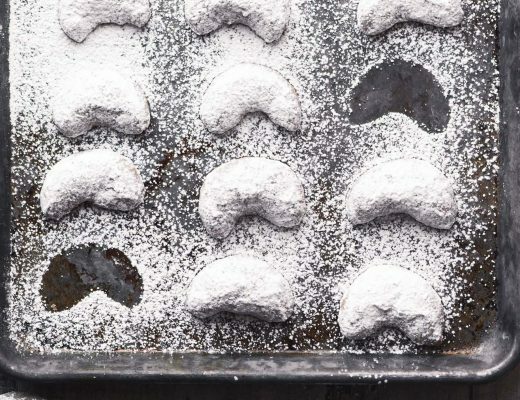 As for the crust issue, you might try lowering your oven temperature just a bit, your temp might be a little high, and making an extra ‘crusty’ crust. Hi I made the clotted cream using 2 pints of cream , after separating it I still have 1 pint of cream which is the same consistency as the double cream I used at the beginning, can I use this to try making more clotted cream or is this a food safety issue ? I’m not sure it would work to re-clot it, Lorna, but you can certainly use the cream within a few days for baking. I suggest making scones! 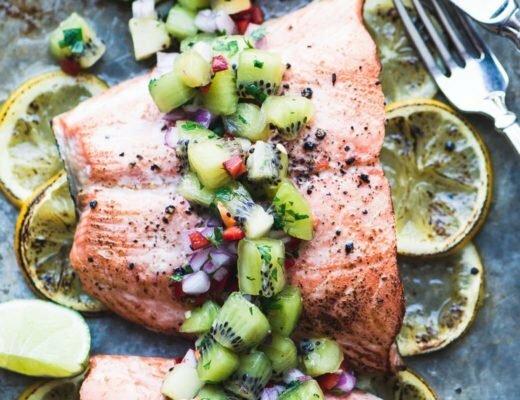 Can you make this in the Instant Pot on the yogurt setting . What do you do with any leftover thin,milky cream? Can it be used for baking scones or biscuits? Yes, absolutely. Use it in place of milk or buttermilk. My clotted cream had a hard crust on top. There was clotted cream under it, but it was impossible to removed the hard crust. It’s not bad, but not smooth like your picture. What did I do wrong? I followed the recipe exactly. There is supposed to be a crust on top, sometimes even pretty hard, that’s part of the clotted cream. One thing I’ve done when I get that is to take my stick blender and blend it up with the softer clotted cream, works like a charm, just don’t blend more than an instant. Another thought is that your temperature was slightly too high, which might result in cream that got too ‘cooked’. How long will it be good for after making? Going to make some for a gift with a jar of jam and some homemade scones ?? It will last a couple of weeks, Linda. Thanks and glad to have you join me! I made this overnight with 3 pints preparing for 18 people. I panicked after checking it in the fridge about 5 hours in. It was still pretty runny. I thought I failed. I called a local tea shop who made me an emergency cup off Devonshire. But I check it again before going to bed and it thickened and was wonderfully perfect! So we had both and I had about 1 cup left over to enjoy to myself! I think it tastier than the Devonshire, but that was my first taste of both. Thank you for an easy great recipe. Thank You for posting this! I will try this soon. How long does this last if there are leftovers? It will keep for at least a couple of weeks, Jennifer, probably more. It’s really going to vary, Melani, but you will get approximately a pint of clotted cream. Does anyone have the recipe to make this in a crockpot? I think I use to leave the crockpot on warm for 12 hours? I’ve tried it in the crock pot Cherie and it didn’t work because it was too hot, I believe the low setting is usually 200 for food safety reasons. Hello! I am getting ready to make the clotted cream to go with the cardamom vanilla cream scones I will be making tomorrow. I only have 1 pint of cream. Do I need to adjust cooking time? Will 1 pint yield enough for 1 batch of scones? Thank you ! I don’t think it will work with one pint Jackie, you need a certain volume of cream to have it clot. If you want to try, make sure to use a smaller container so your cream is about 2 inches deep. I’ve never done a smaller amount, so I’m not sure about the timing, sorry! Thanks Jackie! 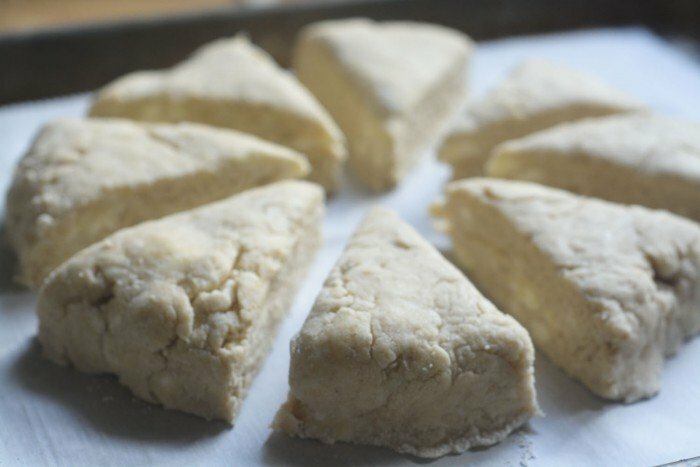 Now that I think about it, I don’t have a recipe for plain scones, but the scone recipe from Savory Simple that is in this post is very good, and you could leave out the cardamom. Hi! I apologize if you already answered this- I skimmed the comments but didn’t read all 330 of them closely. I’ve tried this recipe twice. I get a gorgeous crust on top, and the cream separates into a heavier and a much thinner product, but the crust is only a millimeter or so thick and the “thicker” part of the cream is yogurt consistency, rather than a spreadable creamy product like I remember from the UK. I tried one batch in an 8×8 at 180 and the second in a 9×13 at 200. Same end results. I tried clotted cream at a tea room where the owner ordered it from England and picked it up in Tampa. Delish!! Is it thick like that? I have done this clotted cream several times now and have been successful each time. The family is looking forward to scones and clotted cream this Christmas morning. I reserve enough of the liquid from the pan to make a batch of scones to have with the clotted cream. Our favorites have become the orange cranberry scone and the cinnamon raisin, although plain scones disappear as quickly as any of the flavors, especially with strawberry jam on top of the clotted cream. 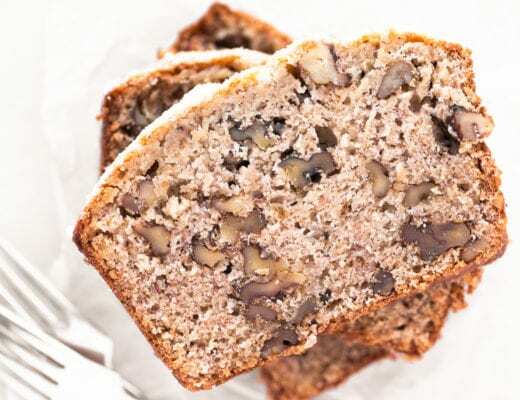 Sinful, yes, but for an occasional treat – lots of fun and good taste. I finished first batch yesterday and it appears to have turned out perfectly. I scooped into a jar this morning and put back into fridge. My question: when the liquid is re-absorbed, does the “skin” soften and become more creamy? I’ve tried and it didn’t work because the slow cooker, even on low or warm is too hot. Does it matter if the oven is fan forced? If it maintains an even temp it should be fine. Can I leave a candy thermometer in the dish in the oven to verify the temperature is at 180? My oven temperature isn’t the same temperature as what I tried to set it to. I have the knob to turn to desired temperature. I put an oven thermometer in the oven. I tried to set the oven at 180, and then checked the oven thermometer. It said it was 200 degrees. I use an inexpensive oven thermometer, made to hang right on the rack so you can check it without opening the oven door. By a good oven thermometer that will give you your oven temperature. 1) I’m assuming that you don’t do any stirring during this process, until, maybe at the end. Is this correct? 2) You said that we can use the leftover cream for baking. Is there some of the cream that doesn’t turn into the clotted cream? 3) How much clotted cream does this make? I made mine in crock pot last night and the side burned and fell into the middle of my cream…help! Presently on my second attempt on this recipe and quite excited to achieve some improved results. With my first attempt, my clotted cream was quite thick and had an unfortunately sour taste. If anyone as a recommendation on how to avoid the sour taste then I would be very eager to apply a recommended solution or remedy. I am using cream from Trader Joe’s which to date is the only non-ultra-pasteurized heavy cream that I can find in my area. The clotted cream I had in England had a slight sweet taste to it. Do you ever add sugar to it? No, I don’t add sugar, but I think that sweetness you remember comes from the cream itself. The flavor of cream comes from the specifics of the cows and how and where they are raised, etc, so English clotted cream might be a bit sweeter due to that. I know farmers who add black strap molasses to their hay. Milk from them is the best. I’m sure this recipe with their cream would be amazing. Probably only smaller farms do this tho. Wow that does sound intriguing! I want to make this. How long does the cream keep after clotting? My little jars of store bought last about a week. Can I make a smaller batch so it doesn’t spoil before I can eat it! It will last about a week Cindy. It’s hard to make a smaller batch because you need the volume for the process to work. You can freeze it and then thaw it in the refrigerator before using it again. I have personally done this and it works just fine. Omg! If this works you will be my bff!! Mine is in the oven and I am not really worried about it turning out. I’m pretty sure it’ll be great. Just want to share that I live in a small town without a Whole Foods, Sprouts or TJ’s in sight. I was able to find Anderson Dairy heavy cream which is not ultra pasteurized at my local Albertsons. Must be the right stuff cause it expires next week where all the others on the shelf are good through October. I made this exactly to the recipe and it came out perfect. 4 cups of heavy cream, baked for 12 hours at 180F. I used a 8 inch round Pyrex casserole. The depth of the cream was at 2 inches, and kept a thermometer in it just in case, checked it every 3 hours to make sure temp stayed at 180F. When it came out of the oven it looked perfect, lite golden yellow with a small amount of butter on top. I thought the recipe had failed because it seemed to only have a thin 1/4 inch thickness of almost crust and was very runny underneath. I refrigerated for 9 hours and almost 85% of it clotted up, only had less than a cup left as a runny milkish product. The cream itself was really thick, I had to pour some the leftover back into it to make it creamy/spreadable. The taste is fantastic. I will make this again. The only hard part was finding the non ultra pasteurized heavy cream. Every normal grocery only had ultra pasteurized but I went to Whole Foods and they had some litely pasteurized, non homogenized heavy cream. WooHoo, I hit the jackpot there, however it was $12 for a half gallon. I have tried this recipe before with normal store bought heavy cream and it fails, it won’t clot or clots very little. It has to be litely pasteurized/non homogenized heavy cream to clot up correctly. Overall 5 star rating, the recipe is right on. Spot on Mark ~ I couldn’t have said it better myself! This is my first attempt at making clotted cream. Did everything according to the directions and when I took it out of the refrigerator some of it was lumpy like cold butter. Is this normal? My fridge runs pretty cold. Would that have caused the lumps? How is it supposed to look and can I fix what I have? The lumps are ok, Jann, clotted cream is supposed to be like ‘clots’. You can stir it up, even adding a little bit of the whey, to make it smoother, but don’t stress, as long as it tastes amazing! Just came back from England and craving some of this. I used to eat this often growing up in the tropics. We just called it milk cream! So yummy. Your recipe is a lot easier to make and will do that as soon as I run to the store for some heavy cream. Thanks. 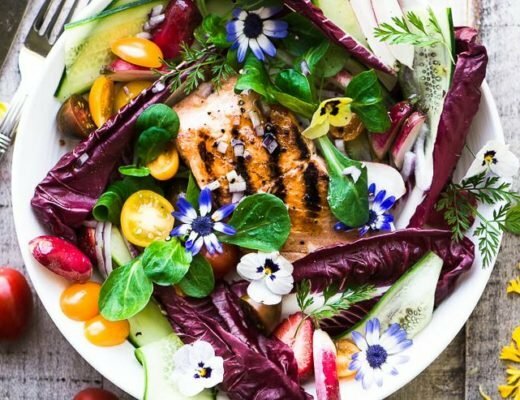 Thank you for posting this amazing recipe. Can you tell me what the shelflife is for this? I can’t wait to make this one. Clotted cream doesn’t last super long, Corina, mine tends to last about 3 weeks. Your recipe sounds delicious. How much clotted cream does your recipe make and how long will it keep in the refrigerator? I made my clotted cream with ultra pasteurized cream. I preheat oven to 320, put dish with cream in oven. Turn oven off. Let sit for exactly 10 hours. Put plastic wrap around and put in fridge overnight. Perfection! Great to know, thanks so much Andrea ~ I’m going to try it! Andrea Russel, could elaborate on your process for making the clotted cream ? What is the end result like in the pan ? And after your refrigerate it ? I do not really feel like purchasing heavy cream and ending up wasting half or even a third of it because it is mainly liquid. All the recipes I have read end up, having half the cream still liquid. It feels like such a waste in my mind. reuse it in your scones. SO RELIEVED TO SEE THIS POST. FINDING NON – ULTRAPASTEURISED CREAM AROUND HER IS A CHORE! I tried this and after refrigerating, I noticed the cream separated. I went to put it into jars and the cream didn’t clott. It clotted a little bit under the crust but the rest was still liquid. Perhaps I did something wrong? HELP! I think i pulled it out too early. All i had on top was a thin hard layer and the rest is liquid… Am I able to put it back in the oven or will that completely ruin it? ? do i need to start over completely? * this is my first time trying to make it. Not sure since I can’t see it, Kayla. Your oven temp might have been too high. It should have a crust on top, and when it chills overnight in the refrigerator it thickens up. You will be left with a quantity of thin whey that gets drained off. If yours doesn’t have any thick cream under that crust, you could try putting it back in the oven for several more hours. My question is ,is it necessary to remove the crust from the clotted cream once you have completed the process and placing in your jar? what are some uses for the crust? I’d like to use all of this yummy stuff and not waste any. Generally you should use the crust, it’s part of the clotted cream and I stir it right in. I tried this recipe yesterday, and while it smells delightful, it developed a bit more of a yellowed crust than yours. I thought i was using the right size pan, but am wondering if i didn’t have it deep enough? The yellowish crust is totally right, Megan, what you do is refrigerate, then stir the whole lot together, draining off any excess whey. Some authentic clotted cream is quite yellow on top when it’s ready. 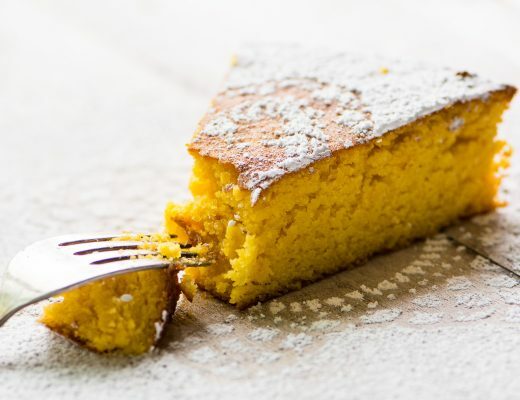 Is there a way to remove the yellow crust? It left the cream very gritty and not very pleasant. Also, I am making a new batch using my crock pot which on warm is only about 140 degrees. Do you know if that is hot enough to be safe? I think you can slow pasturize milk at 145. Thank you! You can life the crust off before you stir your clotted cream Ann. I’m not sure about the 140 degrees, as I’ve only been successful at the 180, but I’d love to hear how that goes for you. I did an experiment using a little lunch bag warming oven (recently purchased) that I use at work as I don’t like to use the microwave. I wanted to see if I could make clotted cream in this puppy. It worked way beyond my wildest hopes. The heating plate used in the “oven” does not go above 165F. So at 8 AM on a Saturday, I poured a pint of pasteurized (not ultra) into a 6-cup Pyrex square dish (uncovered) and let it heat in the little low temp oven for 12 hours while I went about my business. After unplugging the device and letting it cool a while, I put the (now-covered) dish in the fridge overnight. In the morning, I awoke to 12 ounces of dreamy thick clotted cream and 4 ounces of the liquid. That is a pretty efficient yield! I have not mentioned the specific device as I don’t intend to push any product. Any similar device that holds a low-hot temp should work. My experiment made just the right amount of clotted cream and I did not have to tie up my kitchen oven or slow cooker. It also demonstrates that you do not have to keep a steady 180F for a successful result. It was really fun to try this out and the lovely clotted cream was my reward! Cheers!!!! Hello, what device did you use? I so want to try this. I’ve called all the specialty stores up to two hours away. Not one has cream that isn’t ultra pasteurized. :( I’m tempted to try it with what I can get to see if it works. It is so frustrating, Kathy, regular cream has become a thing of the past in lots of places. I will see what I can do to create a clotted cream recipe with ultra-pasteurized cream! Here in the US it says plainly on the container, Monika. Depending on where you live, it may not say, or your cream may not be routinely ultra-pasteurized. I would suggest asking your grocer. I have it in the oven right now. Can you or anyone tell me how long it will last in a jar in the refrigerator when it is cooled and refrigerated as per the instructions? I am hosting an English tea in mid May. I spent a fortune on Amazon for a tiny little jar of clotted cream that has already arrived and has an expiration date of October 2018. Will this last until mid May? Hi Babette ~ clotted cream doesn’t last super long, I’d say up to a month, so I would make it closer to your party to be safe. Well, I left it in overnight at 180. This morning there was a bit of a tan crust on it, but underneath the crust it was just as liquid as when I put it in. I put it back in the oven and will be gone all day. What did I do wrong? Would it have thickened in the fridge? or should it have thickened in the oven? It does continue to thicken in the refrigerator, Babette. But possibly your cream was too deep in the pan? Just wanted to say that our first attempt worked perfectly. Thanks so much for your recipie. 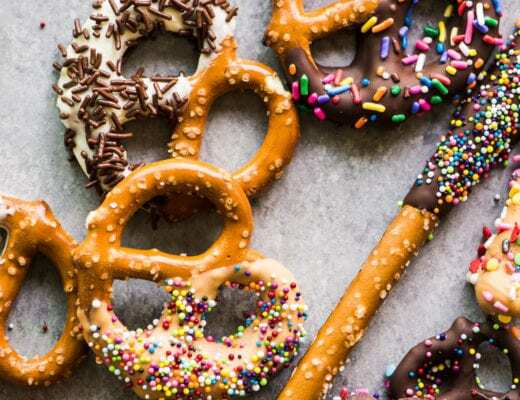 Now, about our waistlines ……. I just made this last nite and unfortunately was unsuccessful. After reading the comments, I realized that a deep baking dish and having a thermometer to check my oven temperature might help… so I will have to try this again. But I was wondering if clotted cream needs to be baked at 12 hours or can the time be shorten? Here’s the results I had: the top had a thick golden brown crusty layer, almost like a dried caramel crust. The bottom underneath was completely liquefied with a separation of fat from the cream at top. It was in the oven overnight. Before I went to bed (approx. 2 hours in), I took a peek with the oven light on… and it already looked like clotted cream. It was thick, raised and very little liquid… would it take that quick to make clotted cream? I used a shallow glass baking casserole dish, approx. 1 inch cream deep and the oven was on my lowest setting… 170 degrees. Should I have taken it out after 2 hours? I used organic heavy cream, pasteurized from Trader’s Joe. I was going to make the clotted cream 3 days ago but had already poured only 1 pint of the heavy cream in the glass casserole dish and realized it was too shallow. So I left that in the baking dish for a few days in the fridge until I could get another pint of heavy cream. I’m just wondering if there is any variation that it could “cook” faster under different circumstances by any chance… does anyone know? I think maybe the shallow cream level was the issue the first time, Karen. Either that or maybe your oven isn’t calibrated perfectly. I don’t know of a way to make the cream ‘clot’ faster, but maybe someone else can weigh in on this. I’ve seen others heat the oven to 160C put the cream in as you did and repeatedly implore you to turn the oven off. Leave for 12 hrs or more. I did this and it worked although I forgot it was in the oven and turned the oven on the next morning and ruined it, but I could see that the method had worked. Karen, what is the “water bath method” please? Mine’s in the crock pot on warm as I write this. Thank you. I didn’t read through all of the comments as there were many, so I’d like to know what size casserole dish to use. The cream should be about 2 inches deep in your dish, Patricia, and mine was an oval 1.5 qt casserole, about 91/2 inches long. It’s THIS ONE. 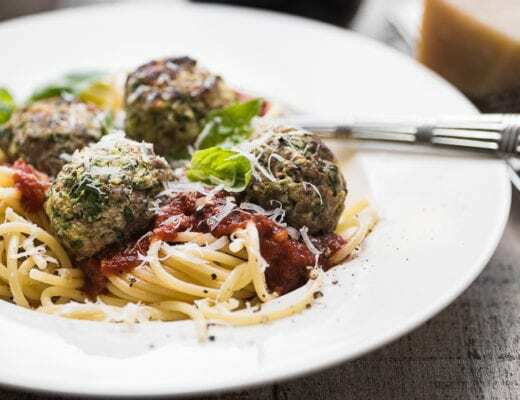 I desperately want to try this recipe, but in Australia all our heavy creams contain thickener (gelatin, etc) – would you know if this will still work? I can’t say for sure, Jordan, you might just have to experiment. Please let us know what happens! That’s not correct . The 600ml tub stuff usually does , but the 1 litre Tetrapak pack type without additives are OK . I had a great British imported brand that I used to put in gift baskets. It’s particularly yummy used with lemon curd on scones. Also fantastic straight from the jar on a spoon. 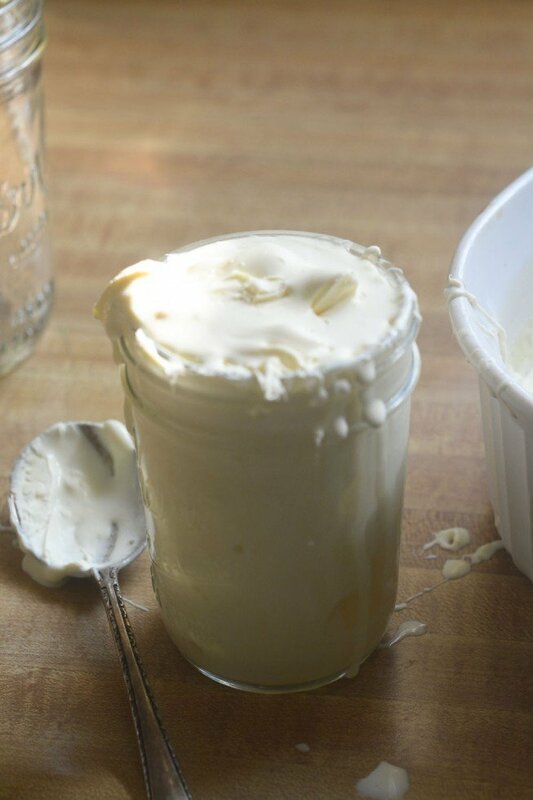 Here are several tips for making better clotted cream. 1) Use really good cream. Taste cream before you start. If it doesn’t taste great, it won’t taste great as clotted cream. 2) The problem that most people describe in the comments is due to the temperature fluctuations in the oven. You see, when you set an oven to 180, the temperature doesn’t stay at just 180. The way an oven works is that the heat turns on for a while, then when the temperature is hot enough in the oven, then the element turns off until the temperature falls below some level. It’s just like the furnace in your house doesn’t run all the time — it turns on and off. In a new oven the temperature might cycle from 178 to 182. In an older oven, the temperature might fluctuate from 180 to 200. In a badly calibrated oven, the temperature might vary from 200 to 220, even though you’ve got it set for 180. At the very least you should put a cookie sheet beneath the pan in which you cook the cream. This will help some, but the very best solution is to use a water bath. That means that you use a pan somewhat larger than the pan you are cooking the cream in and you put some hot water in that pan, then you put your pan of cream in that pan and put the whole works into the oven. This way the temperature fluctuations will be very minor in the cream itself. 3) The pan with the cream should be covered with foil. 4) When this is made in England, it’s made with double cream. In the US you will not find double cream. That means that you will have even more liquid that is not part of the finished product. 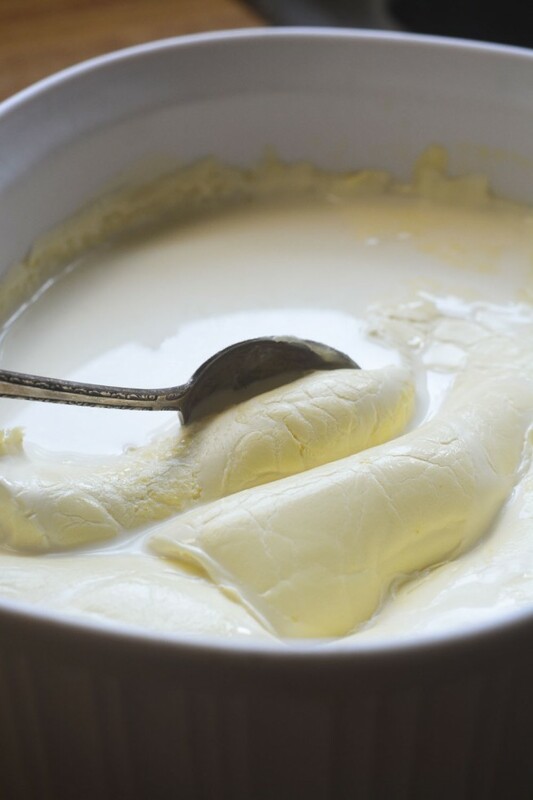 5) What I have found that works the best in separating the liquid from the clotted cream is to remove the pan with the clotted cream and liquid from the refrigerator and then pierce the crust with a spoon. Just make a hole that goes down to the liquid layer. Now very slowly pour off the liquid to minimize mixing the liquid and the clotted cream. Keep pouring off the liquid until the part that you see draining out starts to look like thick cream. At that point all that should be left in the pan is the clotted cream, and some thicker liquid that is like thick cream. You can stir that together, or you drain off the thicker liquid into a separate container and use that like cream. I made clotted cream a couple of days ago and it came out wonderful. There were a couple of differences in the method I used, which I found on another food blog. First, it said to cover the casserole dish, which I did. Then it said to use 170 to 180 degrees, which my oven goes down to 170 so that’s what I used. Otherwise, no differences. It came out wonderful. I used whipping cream from Snowville Creamery in Pomeroy, Ohio which I bought at Earth Fare in Rocky River, Ohio. Snowville Creamery products are SO good! 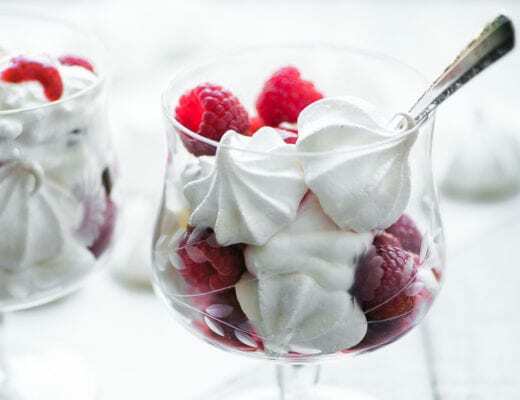 Thank you for the tip, I am going to try this recipe with the Snowville whipping cream. Hi you may have already addresses this, but I couldn’t find the answer. How long can the clotted cream sit in the refrigerator before going bad? We’ve kept ours for several weeks. It’s a bit like milk that goes bad. When it happens you’ll know it. Be sure to use a very clean jar to store it of course. Hi, I have never had clotted cream before. I was just in the UK for a couple weeks recently and I didn’t get a chance to try some. I just made scones and I wanted to make clotted cream to go with them. This recipie looked great so I decided to try it. I got some cream at the store yesturday. Turns out I got the wrong cream and had to return it and go to whole food to by the right one. I put it in a big glass dish, set my gas oven to 180f, and stuck it in there for 12 hrs overnight. It is currently cooling on my stove. I noticed that the top is golden brown, is that normal? If it’s not I’d like to know how to change that. Thanks for your time. I followed the directions completely. And I ended up with it brown and tough on the top and completely liquid on the bottom. I made clotted cream yesterday and did everything as instructed, and the consistency is perfect, but the flavor seems WAY too salty. I used reg pasteurized heavy cream from Smith Brothers and added nothing. I just went to London a few weeks ago and the clotted cream I had was perfect creaminess, not this. What do you suggest? You say the consistency was perfect, but the flavor salty, so all I can think of is that your cream was salty ~ strange! What is your recommended brand? Can I get it in the Seattle area? I live in Seattle and I’ve found the cream that comes in the glass bottles in stores like PCC or Central Market/Ballard Market/etc. works the best. I think the brand is Twin Brook Creamery. You’ll pay a deposit for the glass bottle but get it back when you return it to any store that carries the brand. It really makes a fantastic clotted cream though. The best dairy farm. Their products are great. I used to buy at regular store in Olympia. Hello, I have been trying to attempt to make clotted cream. Before I read your blog, I purchased Ultra Pasteurized heavy cream. That was my #1 mistake. You are right, big mistake. I don’t have a indicator on my oven of 180 degrees, my oven starts at 200. So I Iowered it to where I thought 180 might be. That was my #2 mistake, I need to get an oven thermometer for the correct oven temperature. I put the cream in a shallow pan and it sat about an inch and a half, so I was pleased with that. I kept it in the oven for 12 hours. What I did get was all golden brown on top with very little clotted cream. It was mostly still all liquid, even after I let it set to room temperature and then placed it in the refrigerator over night. I was so disappointed. So I am going to give this another try. Since my disaster I have read your blog and feel that I can accomplish this using the right cream and that the right tools. After spending 3 weeks in the UK and Ireland I came home bound and determined to make clotted cream. I had tea in so many shops I lost count. I love scones with clotted cream so I won’t give up. I’ll post my progress. Thank you! I feel your pain Susan ~ I too spent time in the UK and developed a craving for this stuff. Keep me posted on your progress, and don’t forget the importance of knowing exactly what temp your oven is actually at ~ so be sure to get that thermometer. Good luck! Help? I made this and the consistency turned out about right, but the flavor was way off. Tastes kind of spoiled maybe? I can’t put my finger on it, but it’s not good. I followed the directions. Chilled in the fridge, covered, for probably 8 hours before I scooped it into a jar. It looks right, and reading through the comments, I couldn’t figure out the issue. Any ideas?? I’m curious to try this since I’ve never had clotted cream, but I have a gas oven. Do you think I could make it in a slow cooker? Unfortunately most slow cookers are too hot, Agos, I think. Unless you have one where you can set an exact temperature, I’m not sure it will work. My oven is gas and it worked for me, but mine was able to be set at the proper low temperature. I was oh so excited to try out this recipe. I have a couple of questions though. I followed the recipe and left the baking dish in the oven for 12 hours at 180F. I took it out of the oven about an hour ago, and it is currently cooling on the stove top. My questions however are …. 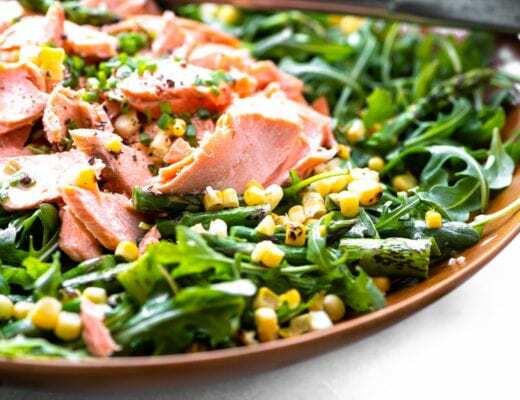 1) Should I stir everything together in the dish before placing the dish in the refrigerator, or should I wait to stir all the contents together after the dish has sat in the fridge for a few hours , right before I place it in the jars? 3) Should I use a slotted spoon to put everything in the jars and just disregard what drips out of the spoon? Thank you for providing this recipe! Thanks for the step by step of your experience Laura, I know it will help others! You do not want to disturb the cream when taking it out. Clotted cream typically has a yellow crust and it should remain on the top. You should cool for an least as long as you heat, and 24hr is better. When you heat the cream, clots form on the surface. The clots are then skimmed off the top. The cream can (and the authentic stuff does) have a golden yellow crust. If it is brown you have overheated the cream and it will be a mess. 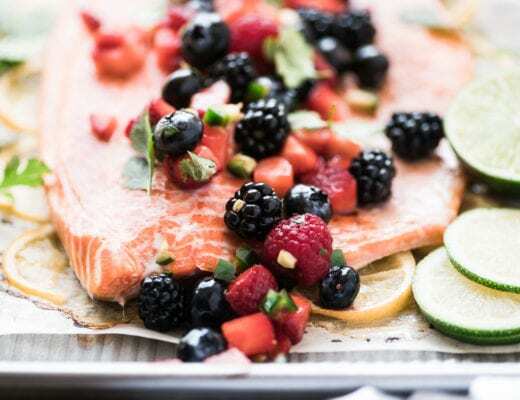 If you can’t get your oven down to a low enough temperature you can always use the scalding method: heating the shallow dish in a large pan of water. 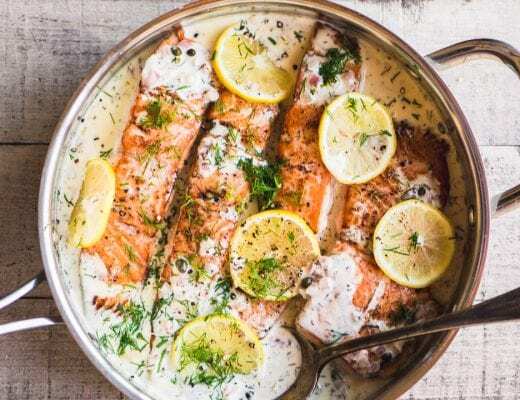 Place a ramekin on the base of a large pan to lift the dish from the direct heat of the stove, and fill the water up to about the same level as the cream in the dish. Do not let the cream boil, the water should be at a gentle simmer. Carefully top up the water when it gets low (I always use a jug with a lip because you risk pouring water into the cream dish instead of the water bath). After 12h (or as long as you dare to tend it) turn off the heat and allow everything to cool to room temperature. Carefully place in the fridge without disturbing the surface for 24h. You can then use a knife to poke a hole in the top and remove any excess liquid (the quality and thickness of the cream will determine how much liquid you have, in commercial production there tends to be very little). Clotted cream forms in fresh milk on its own. Here in CA you can get whole milk that isn’t homogenized with a “cream top”. That is the same as clotted cream. Commercially in the UK the cream has its fat content increased in a centrifuge before being placed in commercial scalding bath units. Using heavy whipping cream that is not ultra pasteurized in a home made scalding bath is about as close as you can get to the real thing without more commercial equipment and access to raw milk or cream. This is amazing! Worked beautifully as written! You know you’re in trouble when this is good on crackers…no need to bake scones! Btw I used Promised Land heavy cream. Thanks for the tip on the cream, and you know, I’ve never tried clotted cream on crackers, Melanie, that’s downright dangerous!! I was wondering which brand to look for when getting the heavy cream so thank you for mentioning Promised Land. I know our store carries that brand. Now I’m anxious to try the recipe! Hi, I just tried this recipe and just now put it in the jars. I was wondering thought, how much liquid I was supposed to have left over in the pan. Even with putting some in the jars with the firmer part I had a pint of liquid left over and got one pint of cream in the 2 half pint jars. I left it in my oven last night at 170 (lowest mine goes) for 12 hours. Cooled it for 2 hrs then covered an refrigerated another 12 hrs. I tried to everything you said even the not ultra pasteurized whipping cream. Is this the way it should have made up?? 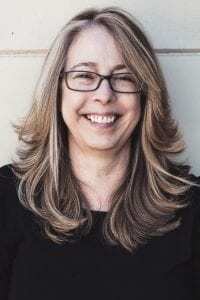 It varies fro batch to batch, Linda, and it sounds like you did everything right! Oh what a bummer, Linda. This can be a tricky recipe, but once you hit on the exact method, you’ll be so glad. Could your oven have been slightly too cold? That’s such a shame Roxanne. All I can think is that maybe your oven runs hotter than it says it is, or maybe your container was very large and the cream was very shallow? Mine turned out the same. I think you forgot to day to cover the dish while cooking. I made this clotted cream last night and it turned out great! The only thing I did wrong was to cover the pan while heating in the oven,,,mis-read instructions! I don’t know if it made a difference or not. i will leave uncovered next time. So glad it worked for you Laura! I’m planning on giving this recipe a try and I was wondering about the shelf-life of clotted cream? Should I plan to use it within a week or so, or does the baking process give it a longer shelf-life? It will last a fairly long time in the refrigerator, Lacey, up to a month…but it’s never lasted that long here! I love this, Norma, what a great memory ~ I can just see your grandmother scooping up the ‘clots’ :) Blackberry jam is my favorite too. Can you tell me how long/what approximate temp you use when doing this on the hob/stove top? Trying to make this as a surprise for Mother’s Day. I bought the correct cream, have it in a shallow dish, but not too shallow, and have left it in the oven for 12 hours at 175F which is my ovens warm setting. Checked on it this morning and I don’t see any skin on top it just looks like slightly thicker cream. My question is do I continue to leave it at 175 or turn my oven up to 200? Is 200 too high? It sounds like maybe your oven’s ‘warm setting’ might have been too low, and even though it says it’s 175, it might actually be lower, if you check with a thermometer. I would probably turn it up a bit and leave it longer. How did it turn out please ?? yay! I love ‘hearing’ the excitement in your voice! If you happen to come back and see my reply, can you let us know where you found your non-ultra-pasteurized cream? Some people are having trouble locating it. We found the Kalona Super Natural organic whipping cream batch pasteurized at Whole Foods. I’ve got another batch in the oven now for a baby shower tea tomorrow. I hope it turns out just as delicious as the last one-yum! Did it turn out as well as your first? I’m thrilled to hear this Donna, and good to know my instructions are spot on :) You can never have too much clotted cream! Any way the one batch is in a glass dish in the fridge so we will see how it turns out in the morning. Real clotted cream as found in the U.K. does have a crust, it’s delicious and buttery. You should not stir the cream back into the whey before refridgerating. After it has cooled from the oven gently put the container into the fridge being careful not to shake for a few hours or overnight. Then scoop the cream off the top with a slotted spoon from the liquid whey underneath. The whey can be reserved for other uses. Then gently stir the cream before putting it into an air tight container, like a mason jar. My clotted cream is currently in the oven as we speak! I’m wondering if you have any recommendations on recipes to use the leftover liquid cream in or if it would be good to just throw in the bread maker as a water replacement? Thank you! Good question, Danielle ~ I don’t know but I’m hoping another reader will weigh in! I would use it in any recipe that calls for buttermilk…..works in every whey ??? I just got back from England and fell in love with clotted cream. I just made this and while it rated delicious it doesn’t have that velvety smooth texture and isn’t very spreadable. I did not leave it on the fridge over night, just from morning to evening. Could my fridge have been to cold? I want that velvety texture so bag! Any recommendations? Hi Monika ~ did you stir the liquid and thickened part together? Be sure you don’t discard the thinner stuff after it comes out of the oven…that should loosen it up and make it the perfect consistency. I didn’t discard it until I was ready to jar it. But I didn’t mix it together. Am I suppose to? Yes, you should stir it all together. Then refrigerate, and while it chills the whole thing kind of meshes together. It’s sort of a stir if needed kind of thing, Deann. I would first refrigerate it and see how thick it gets, then you can stir it together before bottling it. Oh sue…..after reading all the recipe and comments you have just completely thrown me……you didn’t say to stir it at all…infact you said the opposite….thats why in another comment I said to use the remaining liquid as you would buttermilk…..im now unsure how to make it. Please post this comment as its an important step for others. I think the real answer is that the results will vary quite a bit from person to person, so some might stir and some might not. If you just skim off the thick top you’ll wind up with a very thick clotted cream, but if you are left with some liquid you can also mix it in, and it will firm up as it chills. Where do I get non ultra pasteurized cream? Is there anything I can use instead of that? Unfortunately it has to be unpasteurized. I found mine at Whole Foods. Another person’s instructions said that I should cover my cream as it was cooking. Yours said to leave it uncovered. Any chance I’ve ruined it, if I covered it? While a fan of the original in Devon no less, I’ve found Mascarpone cheese (Tubs in CostCo) to be a phenomenal ready-to-eat alternative. I will be hosting my book club in June. The book we read takes place in 1800 England. I am going to have a high tea to recognize this culture. I have never made clotted cream, but had it once in England and it was delicious. I have jars and jars of homemade strawberry jam prepared with berries from my garden. Delicious. I have lots of time to practice. I have never made scones either, but I am a good baker. It’s fun researching all the different recipes. That’s how I found you! I have extra cream in my refrigerator now from Christmas, so I am going to practice very soon. Thanks so much! Sue, does the size of the container matter that the cream is made in? Yes, it does, Coleen, and it’s a little bit of an inexact science, unfortunately. You want the cream to be at a depth of about 2 inches. “Tea Chest” as tea was so expensive, it was always kept locked up so the servants could not steal it. I might add a section in this post about the different definitions of tea time…thanks Jacqueline! So, I’ve tried this 4 times, and each time it’s had to go in the bin. I’m using an oven thermometer and monitoring it, so I know it’s not the temp, and I’m using heavy cream (pasteurized). It gets an orangey brown on top, which turns the cream underneath beige. It’s the wrong colour, and has a funny caramel taste to it (sort of burnt). The last attempt was the most successful (better cream), but I’d say I got less than a quarter of a jar that’s thick (and it tastes funny anyway). Any other ideas what could be going wrong? Clotted cream is one of the only things I miss from home! It sounds like the temp is too high, Rachel, it shouldn’t be an orange-y brown, or smell burnt at that low temperature. Is it possible you have the cream in too large of a container? Seems that everyone has commented on your clotted cream. I have never had the pleasure to taste it on a scone, but it looks like something I must try. My comment is on the filling of your jars! You said it was messy (yup, it was according to your photos). Just get yourself a canning funnel. It has a wide “funnel” part – perfect for filling jars. I have 2 in my kitchen and they are always in the dishwasher from use. Handiest tool ever. Your recipe is intriguing! I am going to try this although my oven doesn’t have a setting below 200F- it just says “warm” so I’ll try making it on “warm’ for the 12 hours. I learned to make clotted cream a bit differently from a friend while I was visiting her in England. In a low sided saute pan- (NOT a sauce pan- it is much easier to scoop out in a saute pan and you have more surface area for the cream to “clot”) pour in a pint of cream and put the burner on a very low setting. When a skin forms on the top- gently scoop it off and collect in a jar. Continue to do this until the cream is gone. The clotted cream will seem partially congealed with watery appearing cream around it but no worries! Just mix it back in with the clotted cream and when finished- refrigerate. It will thicken up in the fridge. 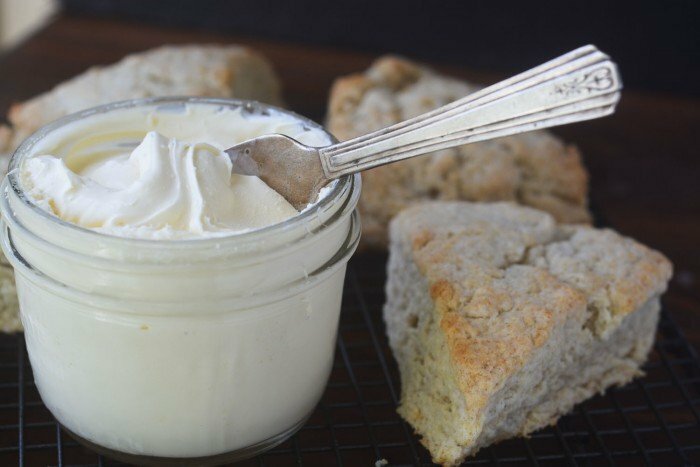 I have made clotted cream this way for years and it has always come out wonderful. The whole process takes me about 30 minutes and there is no leftover cream. Thanks Tamara, I’m interested to try your method! How long does it take for a skin to form? Tamara, I have tried your hob top method and wow it is fantastic! No waste and took a bit of time and careful skimming but the preliminary results looks promising. I can’t wait until tomorrow to taste it! I did the process exactly as I read in the recipe. My cream is not clotted. It is a drink, not a spread. What did I do wrong? Your recipe seems so simple and makes me excited attempt it. However, after reading all of the comments I’m confused. Some are saying to stir, some say no. Some are refrigerating and then scooping the cream off of the top. What is the very best method? After heating in the oven for 12 hours, do you immediately scoop the clotted cream off of the top, jar it and refrigerate? Or, do you let the whole heated mixture cool, refrigerate and then scoop the clotted cream off? Also, how long will this keep in the refrigerator? The best cream tea I ever had was in a small village in the south of England called Newton Poppleford. Their clotted cream was so thick, you had to slice it! I have had the real thing. Silky, gorgeous and delicious Cornish clotted cream. Your recipe, I must say, Is pretty darn good! I used the best possible organic fresh cream . Heaven!! Would i do the same process if i get Raw cream? I think raw cream is perfect for this, Ruth. Thank you for the recipe. Can I use raw whipping cream from my local health food store? Yes, as long as it’s not “ultra pasteurized” it will be great. I was so excited to find your recipe for clotted cream! I tried it with “batch pasteurized” cream (it didn’t say ultra), but it’s all could find when I went out looking so I figured I’d give it a try. Maybe my oven temp is off (I set it to 180), but the top got a thick yellow-ish skin on it that was pretty solid. Underneath it was crazy delicious clotted cream. The yellow part tastes more toasty/cooked, but isn’t smooth like what was under it. Any suggestions? I definitely want to try this again and will grab some cream from Whole Foods next time I’m near one! Thanks for the recipe! Ah, good to know, I’ll go stir it real good… then get some scones in the oven stat!! :) Thank you! I’m excited for you! Thanks for letting me know Anita. Probably worth a try but I imagine the heat is important in order to alter the protein structure etc. After all, clotted cream here in the UK is about 62% fat while heavy/double cream is 50%, but the thickness seems like more than that. I am putting on a High Tea for my daughter-in-law and cant wait to try the clotted cream. Thank you for the recipe. Be sure you try it a little ahead of time, Karen, there’s sometimes a little bit of a learning curve and it’s difficult to predict. This will keep for at least 2 weeks, and probably longer, Linda. Thank, thank, thank you for this recipe! We went to England almost 3 years ago and had tea in the town of Windsor, by the castle and had clotted cream for the first time. I thought it was the most decadent thing I’d ever had. My 14 year old son still wants to have tea with me after school at times. I found your recipe and decided to give it a whirl. Followed it to a T and it came out beautifully and soooooo delicious. I found another recipe that used the left over “cream” in some cream scones so nothing went to waste!! Ended up having tea and scones twice today, with a neighbor and with my son and hubby. Thanks again, you brought a lot of joy to someone who is missing England! I might just try using organic heavy cream since everything is pasteurized these days. Ta for the recipe! That’s what I use, Laurie, I get it at Whole Foods. After reading through many of these comments, one thing to note is that just like butter (or whipped cream for that matter) clotted cream can be frozen. To use, thaw it in the fridge overnight. I’ve done it with fresh real clotted cream in the UK – actually kept frozen for several months and tasted great right up to the end. I have tried many, many times to make clotted cream from authentic recipes here in the US but generally, the cream in the US is not quite “fat” enough and of course the pasteurization is an issue. But I will give this recipe a go…thanks! I devised my own “mock” clotted cream that, although it doesn’t have the divine smooth texture of the real thing, does have a rich similar taste. Take 8 oz. of mascarpone cheese and bring to room temperature. Then whip 1 pint Organic Valley (the highest fat cream I’ve found in a regular grocery store) and whip until very, very thick, just before butter stage. Then, fold (do not whip) the soft mascarpone into the whipped cream gently but as thoroughly as possible. Serve immediately or chill – it holds well and freezes well. I am definitely going to try this recipe. It seems delicious, and if it’s anything like the clotted cream we had in the UK, then it is worth the try…. I got the cream from the health food store and instead of using the oven I use my Salton yogurt maker and it worked perfectly. So easy and so good! Really? I’m going to have to try that now Joe, thanks! How did the yogurt maker work for you? Joe P.
I haven’t tried it yet Joe because my yogurt maker has one large container that is tall and deep and I don’t think it would work…what size and shape is the container of your yogurt maker? It sounds like my yogurt maker has the same type of container, it holds one quart of the heavy cream. The entire quart thickens, a bit unevenly. I let it come to room temperature in its container before pouring it into the yogurt maker. Don’t know if that makes any difference or not. 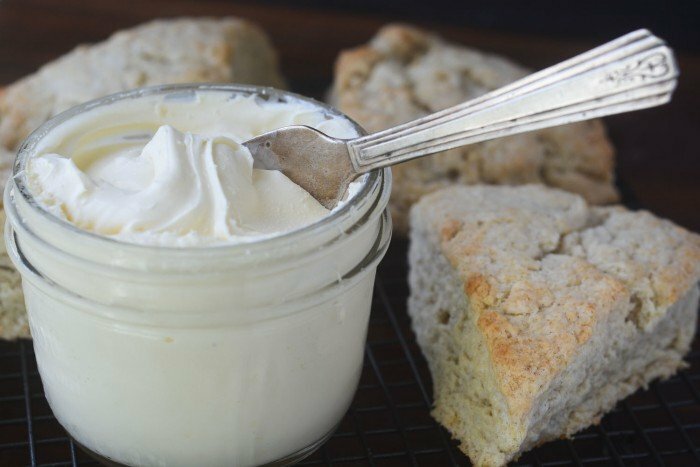 The first I tried the clotted cream I used a yogurt strainer which didn’t yield more than a few drops of excess liquid so I stirred the whole batch with a spoon and it blended into a perfectly smooth product. Sounds interesting…I did try it in my slow cooker on the ‘warm’ setting recently and only got about half the cream to clot, after about 24 hours. The yogurt maker will be my next experiment! Looks delicious…I’m going to try this. The Baltimore is nice however doesn’t compare to the Fairmont Empress in Victoria, B.C. I will whole heartedly agree that the Fairmont Empress was one of the most beautiful and elegant places I’ve ever been to. The high tea was memorable! Love the Fairmont Empress. Really enjoy their High Tea. However, since I live in the L.A. area, will have to give the Biltmore a try. In the meantime, this looks like the ticket to try at home. I was so excited to try this but it did not work for me :( I used a 8 x 8 inch pan and made sure the cream came up 1.5 inches on the side. Used 1 quart of pasteurized cream from Whole Foods (365 Heavy Cream). Cooked uncovered at 180 for 12 hours. When it came out, I noticed it still seemed liquidy and there was a thickish crust on top. I let it cool for about an hour and then put it in the fridge for 24 hours. When I went to scoop it out, it still had a thick crust. Under the crust there was still a good bit of liquid but also solid cream. However, the cream tasted more like cream cheese, not clotted cream. Help! Any ideas as to what went wrong?! Thanks in advance! First, I want to mention that I haven’t tried this yet, but I thought I might try to help since I don’t see any other responses yet. :) I think that “crust” you describe is the clotted cream and is supposed to be scooped off (before refrigeration) and jarred. The liquid underneath that is leftover can be used or tossed, but is not part of the clotted cream. Hopefully I’ll be trying this tonight, so I’ll let you know tomorrow how it works out! I make clotted cream a MUCH easier way by shaking the cream in a jar until just before the butter separates from the liquid. 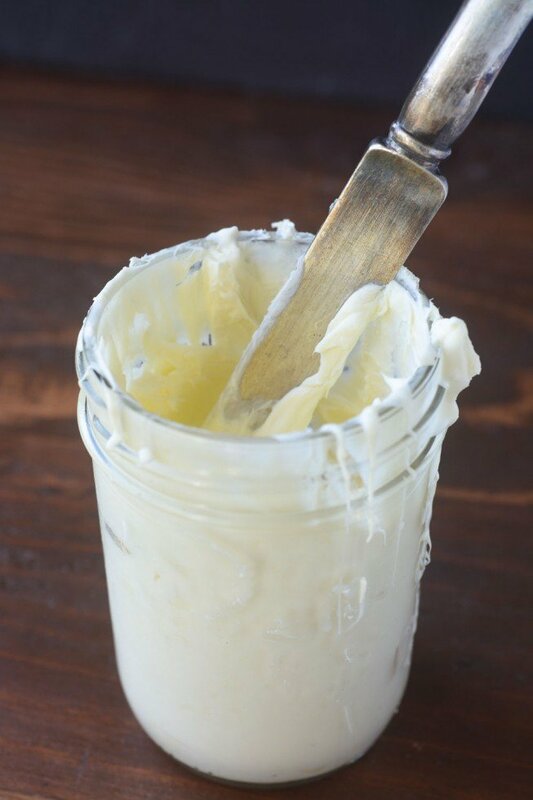 Pour heavy cream into a jar (I use a 1 quart Mason jar) – fill 2/3 of the jar only. Put some sort of agitator in the jar – I have a 1-inch wire wisk ball that I throw in there, but you could use a marble, a lego, etc – just make sure it’s clean :) Then shake and shake. Check it often being sure not to let the butter separate out. You want to stop when it is super thick and sticking to the walls of the jar. At this point, you can use as is or gently strain it for several hours using a coffee filter in a sieve over a bowl. Voila! Sherry, that’s not clotted cream, All that’s happened is that your cream’s butterfat has separated from the whey (the liquid at the bottom of the container) and congealed into those sweet butterfat clumps. Clotted cream needs to be cooked to form the clots, what you made I’m sure was nice but not the same. My local Wholes Foods 365 brand IS ULTRA PASTEURIZED, so are you sure yours was NOT ultra-pasteurized ? Hmmmm, they might have changed it since I bought it, not sure. I’ll check next time I’m there! Mine was definitely NOT ultra-pasteurized, but products are always changing. I used a low temp pasteurized cream from Whole Foods. Wasn’t sure this was going to work but I gave it a shot. I’M SO GLAD I DID! It turned out absolutely perfect. I believe I could have ended up with more cream if it had stayed in there longer (I did 8 hours). A glass casserole dish is a must. Thank you so much for the tip! Do you have any ideas for how to halve this recipe? I do have a smaller casserole pan that I could use but pasteurized organic heavy cream is so expensive that I’m a bit leery to try it out on my own. I know how you feel, Nayda. All I can tell you is that I didn’t have luck when I tried to make it with half the cream. I figured maybe you need the extra bulk of cream so that it doesn’t overcook. Not sure, though, sorry! This sounds to die for! I had no idea clotted cream was so easy to make. I’ll definitely have to give this recipe a try. I could so go for a scone and some clotted cream right now! So I just pulled this out of the oven and from the other comments… Sounds like I’m on the right track. After the only British tea place we had here closed down, I’ve been dying to get my hands on some clotted cream. Will be making scones on my next day off so I’m excited for this and hope it turns out! As a lover of all things British, thank you sooooo much for this recipe. I’m confused! There’s no mention of sugar in your recipe. Don’t you need to add sugar as one does when whipping heavy cream? Blanche, no sugar! We don’t even add sugar to regular whipped cream in the UK. Too sweet. After 3 hours at 180F I had a black tar mess in my oven. I’ve checked the temp on my oven and it was fine. So bummed. Are you sure your oven was really at 180F? I can’t imagine how you would have burned anything at 180F Patricia, that’s a very low temp. Can you check your oven with a thermometer? Are you sure you had the oven on 180F? And not 180C? I tried the recipe and not sure what went wrong but wanted to check in to see if you might have some ideas. So I put the pasteurized heavy whipping cream in the oven for 12 hours at 170 degrees (maybe too low? – I also don’t think it was a case of the oven going to high). There was a very thin pale yellow crust at the top. I stirred it together, and pretty much (within 20 mins.) immediately placed it in the fridge. After about 20-22 hours, I took it out and there was a pale yellow crust (thicker than out of the oven, but still relatively thin) and when I tried to scrape the top, there were very grainy chunks mixed in with the milk. I tried to put it in a jar, but it just came out grainy and milky….not at all like clotted cream. Any ideas what went wrong? Thanks! Other questions. How long did you leave it out before placing it in the fridge and after taking it out of the oven? Did you cover it directly after taking it out of the oven? Thanks again! The key thing is NOT to stir it when it comes out of the oven. It’s supposed to form a crusty top — mine even looked oily in places. But after the bowl cooled, and the mixture cooled for a few hours in the fridge, the thick cream is sitting on top, and you can easily skim it off. I’m Cornish, and so happy to have found this recipe. My aunt taught me to make it on the stove many years ago, but this is so much easier, thanks! Welcome in Vanessa — it’s fun to hear from an ‘expert’! We are trying some in the oven and some in the crock pot right now. After cooking for 12 hours, Do you scrape the clotted cream off of the top, or stir it in with the liquid underneath? And if so, when? Before or after refrigeration? Thanks so much! I stir it all together and then refrigerate, Sally. It doesn’t say to stir anywhere in your recipe and above the Cornish lady says to never stir???? I think it depends on exactly what you end up with, Jo, you can stir if necessary, at the end, as you scoop it into your jars. How long does it keep in the fridge for and what size casserole dish did you use? I used an 11x 8 oblong casserole dish, Nayda. And it keeps in the fridge for about 10 days, maybe longer. So I tried this with a pan of water to see how it long it took the liquid to get to 180° (the temperature that my stove-top clotted cream recipe says to target). Interestingly, the constant evaporation of the water cools the liquid A LOT…I never got the water in a 180° oven to rise above 135°, and even when I turned the oven all the way up to 330° the water topped out at 165°. You could reduce evaporation (and thus increase the temperature of the cream) by tightly covering the pan, but it doesn’t sound like anyone did that. So is the evaporation of the water from the cream in fact an important part of the process, more so than actually achieving a specific temperature? Wow, I don’t know, i clearly have to do some more scientific investigation into this recipe ;) I do think the cream evaporates some because it gets so thick. Thanks for sharing! I had to try a few times before getting it right. My first few tries were unsuccessful as I ended up with a very grainy, split cream. I had set my oven to 180F but it turns out that the oven’s temperature wasn’t constant and sometimes overshot to 220F, which caused the cream to curdle. If you’re having the same issue, i would recommend testing your oven temperature with a thermometer so that you can adjust the heat accordingly. Thank you so much for the recipe! It was worth the multiple tries – it’s delicious! 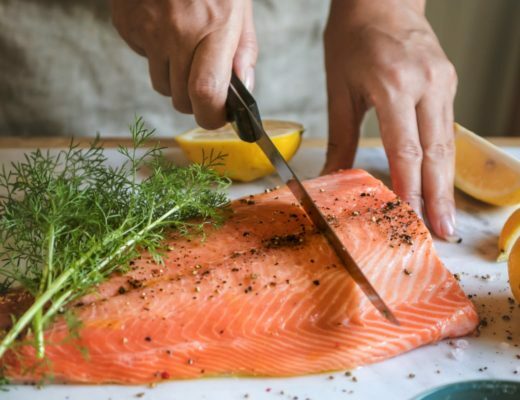 Great advice Nathalie – I think an oven thermometer is one of the best investments you can make in the kitchen, and they are really cheap, too! Oh my, it really worked! And it was delicious. I had my sister over, wo spent some time in the UK and she loved it. Only the scones were a little too crumbly. But delicious, too! I visited my sister, when she was in South England and the only two things I remember is the awfull breakfast with beans and sausages AND scones with clotted cream and strawberry jam. Thanks, will do it again. Yay Viola! It can be a little tricky, getting the container and the oven temp just right, but when it works, it’s magical, I’m so glad you gave it a try! Thanks for that Sosi, I’ll try it. Now that we’re heading into fall, I’m going to be making a few batches. I don’t understand “2 liter of full cream with 2 little 3.5% milk”? What is 2 little 3.5 % milk? 2 little what? Could you clarify? Did anyone succeed in using a crockpot? One of the commenters did use a crockpot successfully, and I think I’m going to give it a try as well. My family wouldn’t want me to run the oven all night long so I think a crockpot would be my best option if I want to try your recipe. I’m doing a miniature, toaster oven trial run for this, and so far it seems to be working great! I’m planning on bringing this in for my English final dressed as Hamlet Sr. :) So glad I’m able to make this from scratch! Sue please help ours didn’t work at all. We bought the right kind of cream and cooked it per instructions in a fairly deep oval baker the cream was around 2 inches deep. In the morning it was go,den brown almost like crime brûlée. We refrigerated all day then I tried to lift the skin off but the thicken cream was attached and under it was a good two inches of pur liquid. Tried to stir it in but it wouldn’t incorporate so we threw it out. I’m sorry it didn’t work for you, Paula. From what you say it sounds like the oven temp was too high. Many times, even though the dial says one thing, the temperature can be different. If you have an oven thermometer, that might be the best thing to try. Uhm, everything I have read and seen says your cream was clotted. The crunchy brown/yellow bits are a part of it. I am giving it a go now. After 5 hrs it already is distinctively golden/yellow. Please give it another go. Thanks, Ava! I have been scouring the internet trying to figure out if I had done something wrong. The texture is perfect, though it looks a bit orange and has a slightly carmely taste. But still delicious! Calibrate/check your oven temp. It is too high. I had the same thing happen with my first batch. Will start another batch for Thanksgiving this morning. I tried this and used exactly 2 pints of organic 35% fat cream, that was not ultrapasteurized in an oven for 12 hours at 170(after reading the comments about slight burning). It just turned out as a hardened yellow disc at the top of normal consistency cream, without anything resembling clotted cream in it at all. Any idea what went wrong? I had to drop significant coin on this cream as most of what is commercially available in Canada has added skim milk powder and what I presume are stabilizers. Just don’t wanna mess this up again. It’s possible that your oven was hotter than the 170F Jesse. I know I always have to count on an oven thermometer to check my temperature. Also check the size of your container, the pan shouldn’t be too large or the cream will be too shallow. There is a sort of hardened slightly colored skin on mine when I get it out of the oven, and then I stir it in and refrigerate, after which the clotted cream becomes thick and rich. So excited to find this recipe! I have always wanted to try clotted cream but could never find any to buy except small shelf stable jars at World Market. Which are expensive and somehow seem like they would not be the “real” thing. I will say if you don’t want to leave your oven on all night (mine is gas so I was leery). You can use a crockpot. Use one of the Hamilton beach ones with the little steam hole, or crack the lid a tad (the oven causes some evaporation while a crockpot will not with the lid on). I can’t wait to try this, Jenny – thanks so much for letting me know – it sounds like an even better method!! Did anyone else get a browned skin on top after the overnight in the oven? I did. Maybe my oven was a little hotter? This morning I just peeled off the brown skin and after cooling, put the dish in the refrigerator. I hope it works!! I did have a little skin on one of my batches, I just stirred it in…I think that means the oven was a little hot, Adrienne, or possibly your cream was to shallow?. Hope it works for you! 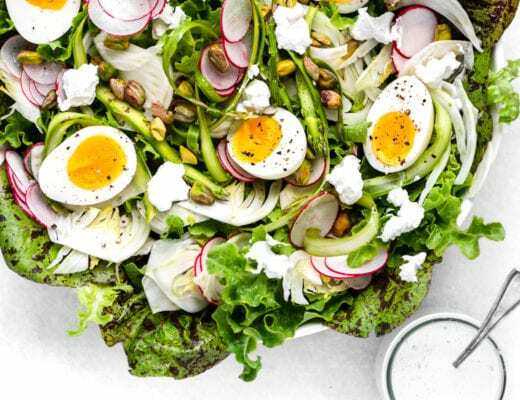 I ran to my local Whole Foods today with this recipe specifically in mind. I saw the cream and it all said pasteurized (not ultrapasteurized though). So I asked a salesperson if they carried UNpasteurized and was told it was illegal for them to sell it that way in our state. Help please! What do I do? Will pasteurized cream work? It looks so yummy and I really wanted it for tomorrow when my friend (who is British!) is coming over. Thanks so much! Yes, it’s pasteurized you want. Just avoid “ultra-pasteurized”. Good luck, and remember to pay attention to detail when making this. I think the 2 pints works best, and make sure your oven is at the right temp and not too hot! The other thing to remember is that after it comes out of the oven and cools, it still needs a good while in the fridge to completely firm up. Unpasteurized cream is “raw” cream, and you can usually get it from local dairy farms if you have any nearby. 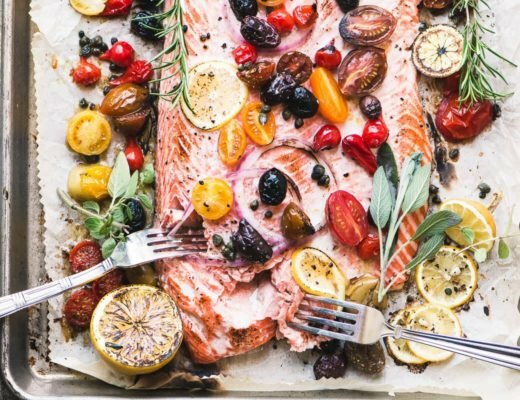 Can I make half a recipe successfully? Looks soooo good! Susan I think it’s much harder to do with half a recipe, but if you do try, make sure the cream has a certain depth to it in your container, and maybe cover it while it’s in the oven. I had one reader try with only one pint and it didn’t work as well. I’ve heard of clotted cream but never had it before. Don’t care for the name but it sure looks creamy and decadent. Will have to try making it and see for myself. 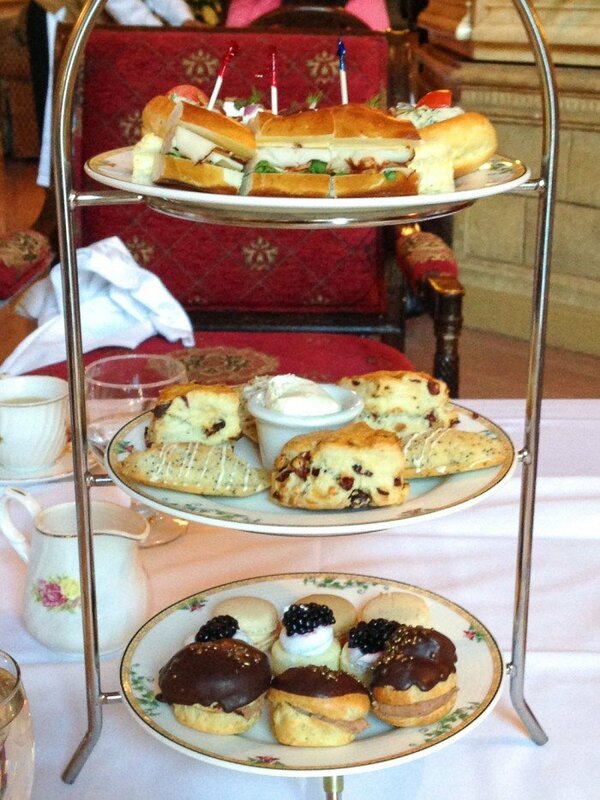 And high tea at the Biltmore looks like a must do! The name is definitely strange, I agree…but you will be glad you tried it for yourself, Sophia! Just pulled mine out of the oven after 12 hours at 180 degrees. And, apparently, my oven turns off on its own after twelve hours. It looks a bit weird with a pale yellow-ish crust on top and watery area underneath. It’s cooling now, and then will go into the fridge. Fingers crossed this works out as I love clotted cream and have a scone recipe at the ready. Mine looked super weird when I took it out of the oven, yours sounds just right — fingers crossed! Thanks, I feel much better now. I am SO EXCITED!! If it has a pale yellow crust you’re doing it right! Clotted cream originates in Cornwall (where I’m from) and it’s always served with the crust on. I can’t eat dairy anymore, but my husband dreams of scones with clotted cream and jam and it’s always near the top of the list of things to eat when we go home to Scotland! I had NO idea you could make this, we’ve tried the stuff they sell here but it’s not the real deal, this will be on his menu very soon! You should make it for him for Valentine’s Day! Oh, how I love having tea and all the sandwiches and desserts to go with it. I was thrilled to finally have tea and the Grand Empress in Victoria and I have wanted to make clotted cream ever since. Just last week, I found a video that shows the same process that you do. I just couldnt’ find the heavy cream. (Slaps forehead.) Whole Foods! Of course. Everything looks lovely, and I have a scone recipe I’m anxious to try– though the vanilla and cardamon sounds fantastic. Wouldn’t it be fun to travel around going to various high teas? Good luck with your clotted cream Debby! 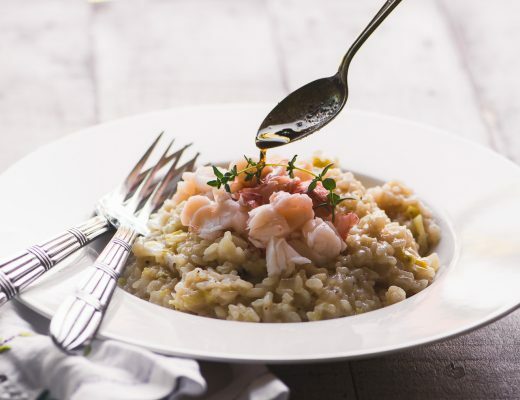 Alton Brown’s version is pretty easy & doesn’t require the oven be on overnight (or at all). Just strain it through coffee filters. That does sounds easy, but part of the distinctive flavor of clotted cream, I think, comes from it being ‘cooked’ slowly. And I can’t imagine that the texture could be as thick as mine if it’s just strained. I’ll definitely have to give it a try to see! Sue is right , Alton’s version is simply thickened cream. British style clotted cream that I’m used to is thick, almost spreadable, and has a slightly tangy almost sour (but not off) taste. 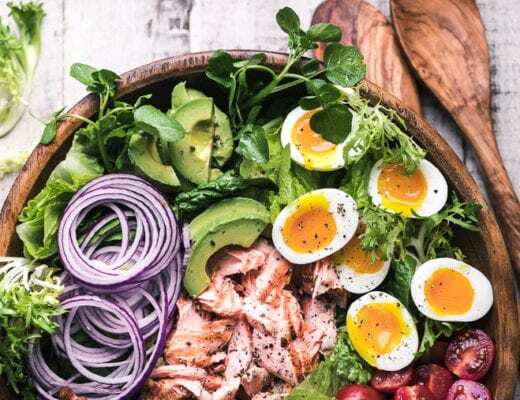 Mmmm….craving this right now! I got to do high tea at the Fairmont Empress in Victoria BC and that was so much fun. What a great treat! Oooooh!!! I LOVE clotted cream! I’ve never been able to find it anywhere outside of Britain and it’s definitely on my top five favorite foods list. Thank you thank you thank you! Just one question: how long do you think this would last in the refrigerator, and how much cream does it make? Is it the same quantity or does it reduce somewhat? It will probably vary slightly with everyone, but I’m going to say it’ll last at least two weeks tightly covered in the fridge, and this recipe makes about 2 cups of clotted cream, which is a lot because a little goes a long way! I do afternoon tea frequently and love hearing about other people enjoying it as well! A friend I introduced to afternoon tea about 20 years ago absolutely adores clotted cream, and it’s been far too long since I’ve made it. She will thank you for inspiring me! The Biltmore is such a fabulous place to have tea and your scones + cream look like a dream! The Biltmore looks fabulous. The Brown Palace in Denver also does high tea and it is fun. Though their decor is not quite as glorious. Love clotted cream and you know I love scones. Yours, in particular! The photos show the Biltmore doing one thing un-British however. When I was in England, they explained to me that you always start to eat from the bottom tier upwards during tea. Therefore, you place the tea sandwiches on the bottom tier, the scones (pronounced “Scunns” and does NOT rhyme with bones-as they corrected me;) on the middle tier and sweets/desserts that you finish last with on the top tier. Clotted cream is such wonderful stuff, isn’t it? And it’s easy to make! I haven’t made any in years, though — but now you have me craving it. Really good post — thanks. Oh, this looks delicious, Sue! Being a big reader (especially of British mysteries and novels), I often wondered what clotted cream was. It always sounded so delicious, and am grateful to have the answer, finally. Got to try this! I had clotted cream for the first time at my first High Tea in York, England last summer while on vacation. I had wondered how it was made, and now I can re-create it! I’m so excited to thy it this weekend. Thank you for this, and for a yummy looking scone recipe. Let me know how it turns out, Katrina, and remember to find non-ultra pasteurized cream! Your timing is perfect. I’m testing a scone recipe and would love to have clotted cream to go with it. Thanks for showing how to make my own! The tea looked lovely. Everyone should enjoy a full-on proper tea at least once in their life, and hopefully more than once! Looks like that you had a great time at the Biltmore! Your clotted cream looks fantastic, Sue. Scones and clotted cream are one of my most favourite things and I’m super jealous of your tea at the Biltmore! Must try making some. What a gorgeous place to have tea, the clotted cream sounds divine. Looks like such a fun and elegant afternoon! I covet the three-level tray and all the goodies on it. As for scones .. I’ve never liked them. They’re always dry and crumbly, but they do hold up well under the weight of clotted cream, the best part of eating scones. I trust you though and might try one of your scone recipes, along with the clotted cream. The LA Biltmore is gorgeous. What a beautiful place to enjoy tea and what a wonderful idea you came away with! I’d love to try making the clotted cream too (I’ve actually never tasted it). Thanks for the delicious idea! 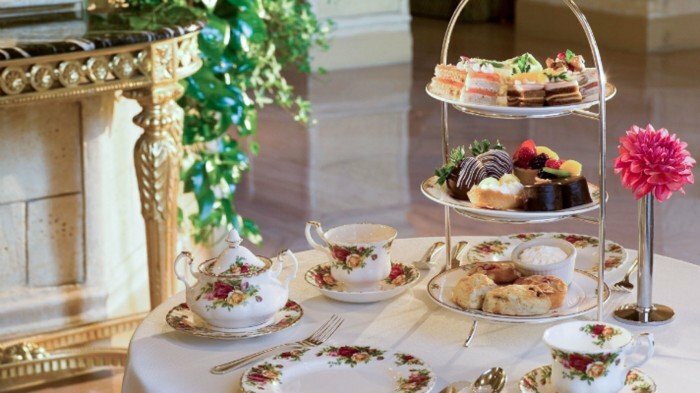 I used to do the pastries for afternoon and Sunday tea serving along with the “club room” daily tea at the Langham Huntington Hotel in Pasadena (which used to be the Ritz Carlton). This post brought me back. We used to go through soooo much Devonshire cream, it was nuts. We’d serve big quenelles of it on a platter with fresh orchid flowers in the middle for decoration. Heavenly. I came across your post… Devonshire cream, I love it when someone knows this item for English split scones, then cucumber sandwich. i just found your blog on Pinterest, and I am so enjoying everything!! I was wondering if you left the oven at 180 degrees or bring it up to then turn it off? I can’t wait to try the clotted cream with the cardamom scones! You leave it on the whole time, Lila, I’ll edit the recipe to make it clearer, thanks! Oh my, how I miss proper Clotted Cream! I spent a good deal of my youth living in Devon and cream teas were one of my faves. Must try this recipe. Wow, you’ll have to report back Linda…I’m not an expert like you, but I’ve had my share of clotted cream, and I think this is great. Oh my! Who knew??? Clotted cream sounds so decedent and like butter only better! The scones look pretty fantastic too – a perfect combination! We love the Biltmore (in Ashville, NC). An amazing era. Your photos of the afternoon tea are wonderful! I can just imagine tea at the Ashville Biltmore…I still haven’t been to see it but I hear it’s incredible, it’s going on my 2015 bucket list! OMG, I am drooling over that clotted cream! My cousin sent me a postcard from England with this recipe on it years ago and why I still have never made is beyond me! This looks absolutely brilliant, Sue. It was so much fun to go to the Biltmore with you and Cynthia, and I hope we can do it again soon! I am seriously blown away by the texture of this stuff…you need to make it asap! So jealous of your tea! It looks absolutely regal. And that clotted cream looks insane. I just made homemade butter, and it definitely won’t be the last time I do! I think it’s fascinating that butter and clotted cream are essentially the same thing, but with such different tastes and textures! What a lovely tea! I make scones for my family and whenever we have them, I start speaking in my fake British accent and saying things about clotted cream. : ) So I am so happy to learn how it’s actually made. Thank you!! Looks perfect. Haha! I have bought the expensive little jars from Britain when i really wanted to get fancy, but this homemade version makes so much sense, I mean how good can anything made with fresh cream be in a jar? The Biltmore .well looks positively superb. My husband is a fan of cream..sour..clotted..all kinds..Good to know..Thanks! Let me know how it works for you Monique. i am having trouble finding heavy cream , is it the same as whipping cream? Yes, you can use either, Helen, but you need to look for cream that is NOT ultra-pasteurized. I adore going to tea and I imagine that the Biltmore is just about as lovely that it gets for that kind of experience. What a fun afternoon!! It’s kind of hard to live that afternoon down, but the homemade clotted cream helps…thanks for stopping by Mary. It seems Organic Valley is about the only one who makes pasteurized Heavy Cream, but I am not able to find it in the Whole Food stores in Los Angeles area. Would you let me know what brand you use and where do you get that from?